In Windows 7, when ever you right click on the icon in the taskbar, you will see the jump list and contextual items like close and unpin or pin the program. Are you missing old classic menu as in Windows XP? You can easily get the classic version of the contextual menu: like restore, minimize, maximize or close on Windows 7 computer using following keyboard shortcut trick. 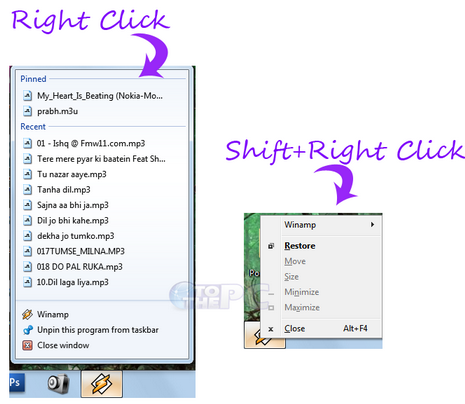 In order to reveal the classic version of the contextual menu in Windows 7, you have to press and hold the shift key and then right click on the icon to see the older version of right click menu.